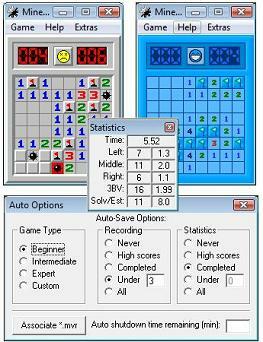 Minesweeper X is the easiest offical version to use. - Optional Shut-Down timer to stop you from playing too much! MSX was the first version of minesweeper to have videos and recording options. Videos are allowed on the World Ranking. No installation is needed, the program is only 60kb and runs fast on any Windows system. A popular feature is creating your own skins. Since MSX is streamlined there are only time highscores and its history file is basic.